Darth Vader. The name conjures up a hundred pictures and a thousand quotes. He is one of the greatest villains of all time and one of my kids' favorite movie characters. We are so excited for the new Star Wars Rogue One movie, I am going to see it on opening night. I'm sure my kids will see it sometime after Christmas. We are a Star Wars family. From clothes, to movies, to toys, Star Wars rules it all for us. 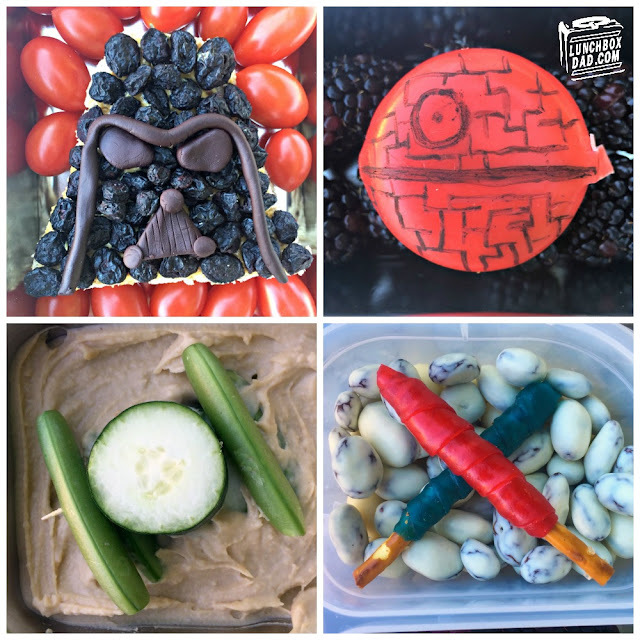 If you have been reading my blog for any length of time you know that I have made a ton of Star Wars lunches. I'm sure I will continue to make many more. I made this dark side lunch in a Planetbox lunchbox. It's my favorite metal lunchbox around and it complements the industrial look of the Empire pretty well. Of course I had to add a TIE Fighter in too. Too find out how I made it, keep reading below! Ingredients: Two slices whole wheat bread, cream cheese, dried blueberries, black Wilton's Shape N Amaze edible decorating dough, grape tomatoes, hummus, cucumber, sugar snap peas, Babybel cheese, blackberries, toothpicks. Optional: yogurt covered raisins, pretzel sticks, blue and red fruit rolls. 1. Cut both slices of bread in bell shape. This will be Vader's helmet. Cover one slice in cream cheese and then cover cream cheese with dried blueberries. Use edible decorating dough to make his facial features. Place in main compartment and surround with grape tomatoes. 2. Using black marker, draw Death Star lines on Babybel cheese as shown. 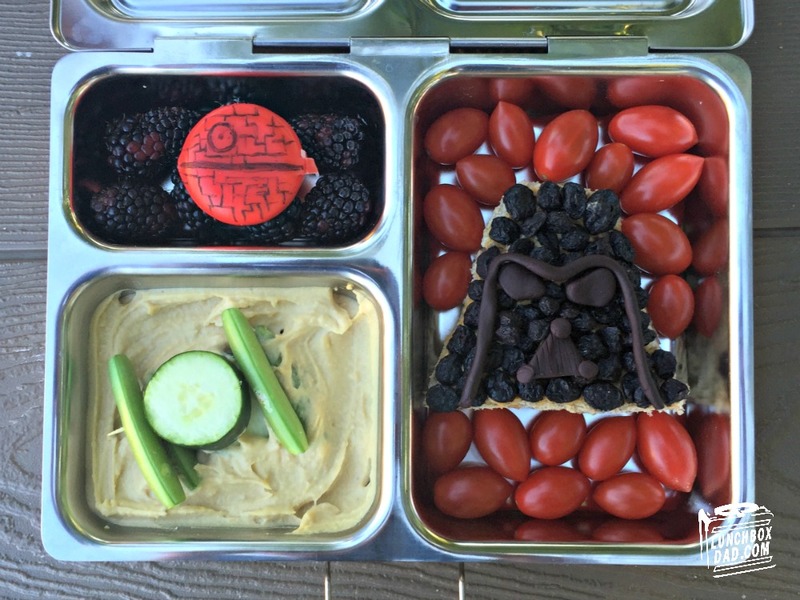 Put blackberries in side compartment and place Death Star on top. 3. In second side compartment scoop in hummus. Stick a toothpick through a slice of cucumber. 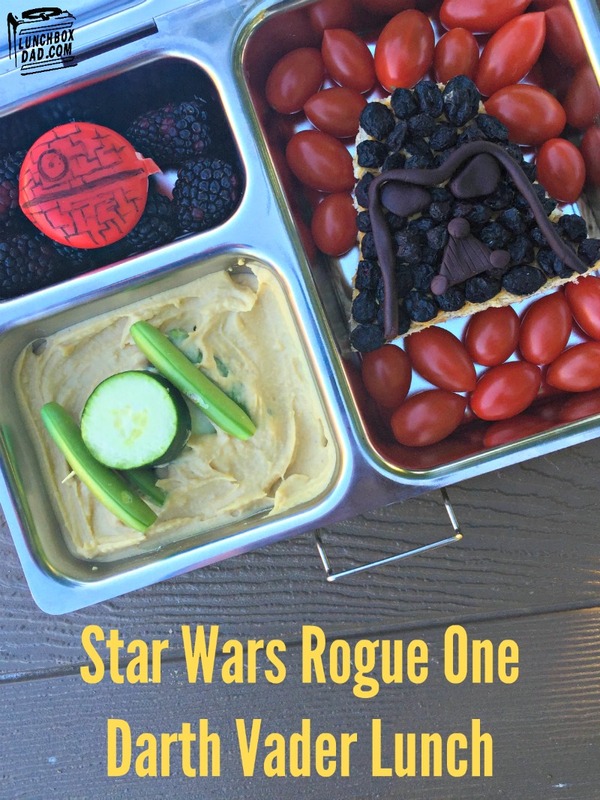 Attach snap peas to the sides to make the TIE Fighter. Place on top of hummus. 4. Optional: Drop yogurt covered raisins in side compartment. Wrap pretzel sticks with fruit rolls to make light sabers. Place on top of raisins.